Can you af-Ford not to get a smartwatch now? If you're one of the few people that has both an electric or plug-in hybrid from Ford and an Apple Watch or Android Wear device, then you may want to download Ford's new smartwatch app. In an update to the MyFord Mobile app on iOS and Android, Ford has introduced smartwatch functionality that gives you access to a host of new features from your wrist. These include remote climate control, locking and unlocking, range and charge status, and walking or driving directions to your parked car – in case your memory's a little hazy. The smartwatch functionality only applies to C-MAX Energi, Focus Electric and Fusion Energi vehicles, but it was designed to accommodate both round and square-faced devices. 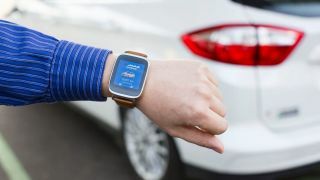 Ford isn't the first company to embrace smartwatch-to-vehicle connectivity. Hyundai launched some similar functionality when it updated its Blue Link system back in March. And additional smartwatch tech isn't the only thing contained in the MyFord Mobile update. The main app also introduced pinch/zoom capability for Google Maps, and an alert that helps you find nearby charging stations if you're running low on juice.